10 "Ithaca Democratic Socialists of America Presents #485"
Michael Hirsch is a labor journalist and union staffer in New York City. A member of the national political committee of the Democratic Socialists of America from 2003 to 2009, he is also on the editorial boards of New Politics and Democratic Left. Hirsh is a New York-based labor and politics writer and a moderator with the Portside news service. An erstwhile sociologist, steelworker, labor educator and union staffer, his work has appeared in The New Statesman, the NY Observer, Village Voice, Labor Notes, New Labor Forum, Crain’s New York Business, The Indypendent and other venues. He is a member of the Lower Manhattan and Labor branches of New York DSA. 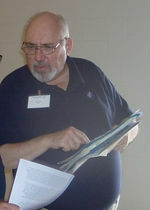 Michael Hirsch signed an April 2003 Open Letter, initiated andcirculated by prominent Democratic Socialists of America (DSA) member Leo Casey, calling for the lifting of trade sanctions against Cuba. Holly Sklar, a long time activist and author whose works include Raise The Floor: Wages and Policies That Work For All of Us; Streets of Hope The Fall and Rise of an Urban Neighborhood (about Roxbury's Dudley Street Initiative); and Trilateralism: The Trilateral Commission and Elite Planning for World Management,which foretold the global corporate economy long before globalization was a buzzword. She has also written for Z Magazine, The Nation and USA Today,and is a consultant for United for a Fair Economy. Michael Hirsch, a labor journalist and union staffer who is a member of the National Political Committee of Democratic Socialists of America, the editorial committee of Democratic Left, and the editorial board of the journal New Politics. In the 1970s he was a member of International Socialists and active with the United Steelworkers Union in Gary, Indiana through 1985. Harris Gruman, has headed DSA locals in Boulder, CO, Baltimore, MD, and Boston, MA. He is now Director of Massachusetts Neighbor to Neighbor, which organizes low income urban neighborhoods on economic justice issues and has focused its electoral work on the state legislature and , since August, pro-Kerry swing state phone banking. In 2004 Hirsch ran as a Dennis Kucinich delegate in the March primary, outpolling the Ohio congressman in New York’s 14th C.D. by some 200 votes. “Dennis ran on my coattails,” Hirsch says. Michael Hirsch of Democratic Socialists of America, Mark Levinson of the Economic Policy Institute, Washington D.C. and Michele Rossi were speakers on the An Agenda for America: Demands for this Congress, and the Next panel at the Left Forum. The forum was held March 9 - 11, 2007 at Cooper Union College, New York City. In 2008 Michael Hirsch of Democratic Socialists of America, New York signed an online petition “A Open Letter to Barack Obama on Iran”. In 2009 DSA member Rob Saute was the primary mover behind the establishment of NYC DSA Economic Crisis Group, which has since attracted the active participation of Karie Gubbins, Jason Schulman, Michael Hirsch, Itzhak Epstein, Peter Frase, and Chris Maisano. The NYC DSA Economic Crisis Group seeks to study the reasons why the current economic crisis happened and possible ways in which the local, national, global economies can be restructured along more democratic and egalitarian lines. It will attempt to use such understandings to conduct economic organizing in New York City, produce a small number of short pieces of popular literature on the crisis, and conduct public educational fora that will advance an analysis and program of action that reflects the ideological and political orientation of DSA in the broad left, which could use an infusion of the kind of visionary yet pragmatic radicalism that is our organization’s hallmark. Such activities will also be aimed at recruiting new members who are interested in gaining a deeper understanding of the causes and consequences of the crisis and who are open to embracing the particular intellectual and political contribution DSA can make. We believe that these goals are achievable, and that any socialist organization worth its salt should have a theoretical and practical program concerning the deepest crisis of capitalism in 80 years. As of 2009 Michael Hirsch served on the Editorial Board of New Politics, magazine almost completely staffed and run by members of Democratic Socialists of America. Hirsch is listed as an endorser of the Campaign for Peace and Democracy, as of March 15, 2010. "Ithaca Democratic Socialists of America Presents #485"
"Tax, Then Spend in New York State" Ithaca Democratic Socialists of America member Charles Dunaway draws on information presented in 2010 by James Parrott of the Fiscal Policy Institute, DSAers Michael Hirsch, Maria Svart and Assemblywoman Barbara Lifton to show that New York State could easily afford to pay for what it needs, if only people would demand a return to earlier income tax rates on top incomes or a return to the stock sales tax that the state once had. Recorded Feb. 16, 2010, March 20, 2010, and February 7, 2011. Michael Hirsch was a New York Democratic Socialists of America delegate to the DSA 2015 National Convention. In 2016 Michael Hirsch was a member of NYC Democratic Socialists of America. He signed the Give The People What They Want: DSA Members on 2016 and Beyond letter. CoSigners, as of July 23 2018 were: Michael Hirsch. This page was last modified on 10 March 2019, at 19:20.